The Great Steak & Potato Company offers a variety of location configurations for store units and business options. We are currently licensing area development deals as well as franchise agreements for all of Kahala's branded concepts, which includes a variety of good-for-you branded concepts that are in step with today's growing trend towards low-fat, nutritious eating. They include Blimpie, Cereality, Cold Stone Creamery, Frullati Cafe, Great Steak & Potato, Johnnie's NY Pizzeria, Nrgize, Ranch 1, Rollerz, Samurai Sam's, Surf City Squeeze and TacoTime - all of which deliver strong unit economics, people-pleasing menus and operational ease. Kahala is also offering co-branded opportunities to both existing franchisees as well as new prospects. Great Food and Ease of Operation - That's The Great Steak & Potato Company. Easy to operate and all of the support you need from an experienced operator. Please note interested parties should have at least $100,000 to invest. Click on Request Information button above for FREE information on how to start a Great Steak & Potato Company franchise today! 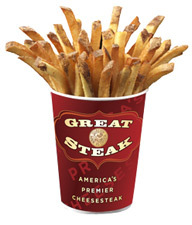 Please Note: Great Steak & Potato Company franchises for sale, and other franchise opportunities, business opportunities, businesses and franchises for sale on this web site are not to be considered as an "offering", "franchise offering", suggestion or recommendation by GlobalBX. The franchises, businesses and business brokers seen on this web site submit their own individual content. This advertisement depends entirely on the truthfulness of the information provided by our advertisers which includes, but is not limited to, franchisers, franchises, franchise brokers, franchise consultants, business sellers and business brokers. As always, GlobalBX recommends that you consult a lawyer, financial consultant, accountant or professional advisor before buying a franchise or business opportunity or any type of business. By submitting this form and requesting more information, you have agreed to all terms and policies of GlobalBX and the business and franchise offerings listed here. Please review our Terms & Conditions for more information.